It's been awhile since we've seen anything from the Vacation reboot, with the new trailer debuting in early June. While we get closer and closer to the July 29 release date, New Line Cinema has released a new photo gallery, featuring stars Ed Helms and Christina Applegate as Rusty Griswold and his wife Debbie. We also get new looks at supporting cast members Charlie Day as a rafting tour guide and Chris Hemsworth as Rusty's brother-in-law, Stone Crandall. The next generation of Griswolds is at it again-and on the road for another ill-fated adventure. Following in his father's footsteps and hoping for some much-needed family bonding, a grown-up Rusty Griswold (Ed Helms) surprises his wife, Debbie (Christina Applegate), and their two sons with a cross- country trip back to America's "favorite family fun park," Walley World. 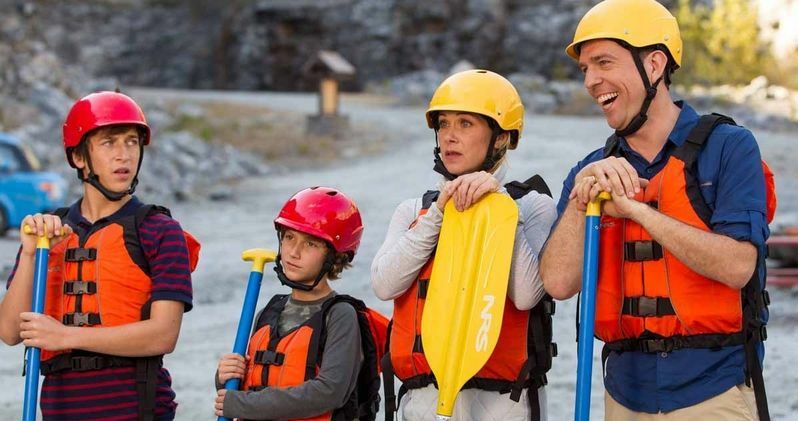 The supporting cast also includes Leslie Mann as Rusty's sister Audrey, Skyler Gisondo and Steele Stebbins as Rusty's sons and Charlie Day as a whitewater rafting tour guide. Original Vacation stars Chevy Chase and Beverly D'Angelo are also back as Clark and Ellen Griswold in this reboot from John Francis Daley and Jonathan M. Goldstein, who wrote the script and make their directorial debuts. The filmmaking duo are best known for writing Horrible Bosses and The Incredible Burt Wonderstone. The project faced a few early delays before production began, but now it could be one of this summer's big hits. The supporting cast is rounded out by Elizabeth Gillies, Kaitlin Olson, Michael Peña, Nick Kroll, Keegan Michael Key, Samm Levine and Tim Heidecker. Do you think this Vacation will be a trip worth taking when it hits theaters in just a few short weeks? Check out the photos and let us know what you think.